Of course, Victoria has very neat and organized boxes. Victoria moved recently, so we had a nice talk about how we tip movers and try not to abuse our friends when they help us out. Victoria: I have something else for us to talk about! Moving etiquette! And tipping! Jaya: Oooh! 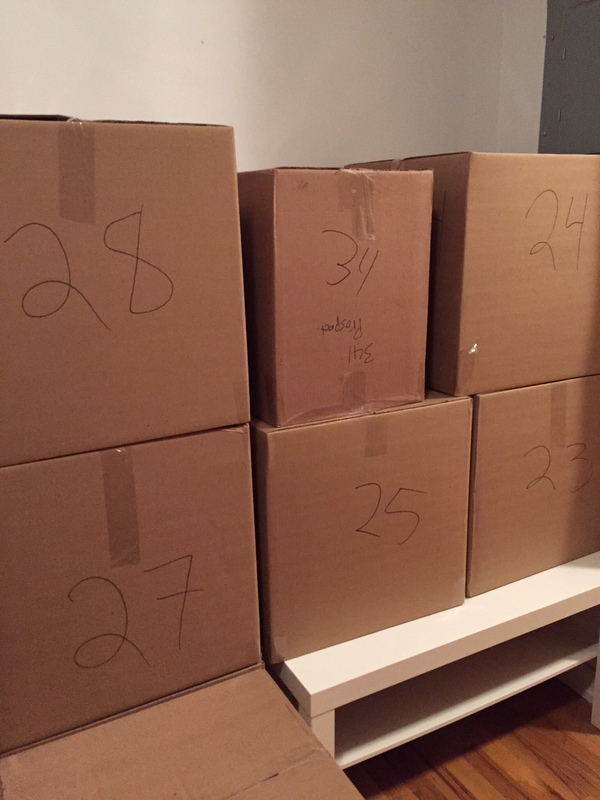 So what sorts of issues did you run into during your move? Victoria: So I wish you had been here and not swanning around Europe when I was trying desperately to figure out how much would be a fair tip. Have you ever used movers? Victoria: Matt said that you guys gave them like $20-30/guy. Jaya: I think that’s about right, and made sure to offer them lots of water. Victoria: Ahh but other things online told me they are NOT paid well and tips are essential. Basically what I found is that no one agrees. Some things said 15-20% of the total move, some things said $20 per person. Jaya: Interesting, The couple links I just pulled up said 5%, but yeah, it varies. I think if you’re going with a moving company, you should absolutely call and ask a manager. Victoria: But yeah, i think basically you should also go with what feels right, like they also didn’t break or damage a single thing. And like I said, really fast and professional. Whereas if they had been slow and sloppy, the tip would go down. Jaya: Absolutely. Yeah, I would probably call a manager earlier and ask what the standard is, and then keep that in mind as they do things. If they’re breaking stuff and being jerks, you don’t have to meet that. Victoria: Yeah, that probably would have been a good idea. Haha, although, I was such a stressball during this move that I think the manager was getting tired of talking to me. Everything was at the absolute last minute and I changed the date once, haha. Jaya: The other thing I always think about is how moving affects your neighbors. There have been many times when someone is moving into or out of the building where they prop the doors open to get stuff in, but nobody is there watching the doors. Victoria : The door thing doesn’t bother me so much because usually there’s a steady stream of people in and out. Oh yeah! My new ~*fancy*~ building has rules- we had to move in on a weekday before 4pm so as not to inconvenience other tenants. AND they made the movers bring everything into the garage and put it in the elevator there instead of going through the lobby which also makes sense. Jaya: Ooh that makes sense. Victoria: So what about when your friends help you move? Beer and pizza? What age is it no longer quite cool to make your friends move and you should really be hiring movers? For me, I was definitely not going to be having anyone help me move because I have a TON of stuff and lots of heavy furniture. We had, i think, about 57 boxes. Oh! And our movers mentioned they were happy we put all our books into little boxes so they weren’t too heavy and we were like duh, and they said that not everyone thinks of that. Jaya: Ooh that’s true! I mean really, I think you can always ask your friends for help, but as we get older you gotta realize not as many people will be able to. Victoria: Yeah, definitely. Although, I did actually have some friend help this time! So due to the terrible complexity of the situation, I had to sign my lease at 9am on the day of my move and the movers ALSO wanted to arrive at 9am. Luckily, a friend didn’t have to be at work until noon that day, so he came and sat in my apartment to let the movers in until I got back. I bought him a doughnut the day of and I plan to buy him dinner sometime soon. Jaya: Aww that’s nice! Yeah, I just helped another friend move, but by that I mean I waited in the van and made sure they didn’t get towed while he and his brother carried all his furniture. Victoria: Hahah yeah. That type of help is always good to give. Also, the building I moved into works with a broker to fill the apartments, so we had to do everything through him (and pay a fee, grrr) but he did come by with a couple of bottles of wine as a housewarming present, which I thought was pretty nice. Jaya: Hahah that is like, nobody’s experience. I mean that’s amazing but don’t get anyone’s hopes up. Victoria: Hahaha I know! It was so strange. Also, my previous landlord returned my deposit within 3 days of me requesting it with no fuss. Jaya: Are you a witch or something? Victoria: I guess! Maybe it’s karmic retribution for having literally the most stressful move ever. And I basically live in a castle now, so.